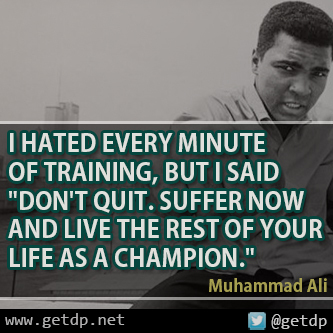 GETDP: I HATED EVERY MINUTE OF TRAINING, BUT I SAID "DON'T QUIT. SUFFER NOW AND LIVE THE REST OF YOUR LIFE AS A CHAMPION." I HATED EVERY MINUTE OF TRAINING, BUT I SAID "DON'T QUIT. SUFFER NOW AND LIVE THE REST OF YOUR LIFE AS A CHAMPION."